One Million Smile Cards And A Surprise! What all these acts of kindness have in common is Smile Cards. When folks did these acts, they also left their recipients with a Smile Card that encouraged them to pay it forward to someone else. Each one of those little pieces of paper served as a reminder to keep goodness rippling in our world. Recently, we crossed our million-Smile-Card mark. When we printed our first 100 cards, in 2003, we didn't know if we'd ever do another print run but we did know that 100 ripples of kindness is a pretty powerful thing. Lo and behold, compassion is contagious and people really took to the idea, and it spread like wildfire. 56,411 orders from 145 countries, all shipped by volunteers and supported by a 2 dollar donation here and 25 bucks there. And that was just what we could measure. All our graphic files are online, so people reprinted locally, remixed it and spread all kinds of ripples. Peter and Marty Hagerty, for instance, made hand-drawn Smile Card and randomly tagged customers with free wool. Vinod used it as a response to violence in Bombay. Tens of thousands of stories were posted on our site, and each of those created ripples too -- like Chad Harper who created a hip-hop song after being so moved by a grandmother's act at the pharmacy. Almost every week, we would get notes from people who say that their faith in humanity in restored by simply having discovered the website. Now, both of these kids were quite familiar with Smile Cards. On his 10th birthday, Neil remembers doing free car washes and on his 11th birthday, he tagged an entire plane. Similarly, Dillan screened the Smile Card film for his entire freshman class and ignited a movement in his school. Over the summer, they both wanted to "step it up." So we wondered, "What if we put a QR code on each one of our Smile Cards? Then, each card would be like a live trail of kindness stories!" They loved the idea. And working at the pace of today's 14-year-olds, :) they got 100 unique cards printed within a week! We flexed some of our technology muscles to create a website and a mobile app, and lo and behold, we had trackable Smile Cards! 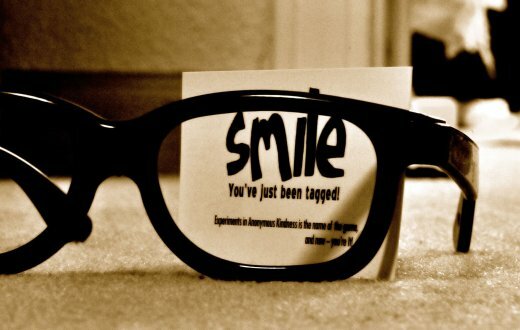 The idea is this -- you do an act of kindness, leave a Smile Card behind and log the act online. The person who receives the card will do the same, and that will create a trail. Just as wheresgeorge.com tracks dollar bills just for fun, this will track acts of kindness. Those who have a QR code scanner on their smartphone can just scan the code and enter the story online; others can just visit HelpOthers.org and enter the code online to share the story and see what others have said. WELL DONE!!!!!!!!!!!!!!!! I can't wait to get my hands on some and start sparking ripples. The funny thing is that this really inspires me to raise my game, on the (mis?) perception that *normal* acts of kindness are fine for *normal* smile cards, but now that cards are trackable, I want to make sure that my acts of kindness really STAND OUT. AND, I want to have some of the earliest tracks in the system so that 50 years from now, when a battered, taped together, mangled smile card is handed to me with a tracking number in the 000001 range, I will have come full circle :-) LOVE IT. Thanks for making my month with this delightful surprise. That's just the informal inauguration. :) By next week, they plan to have a video and a few other things. I'm sure the stories will continue to bloom. With trackable Smile Cards, maybe we'll find out just how many rounds! This is very exciting. Neil and Dillan, it's great to see you two making your mark in the CF ecosystem. Rock on! Awesome! You guys rock, Dillan and Neil!!! 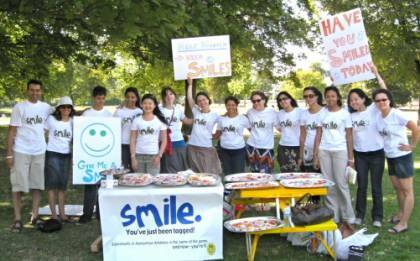 I remember quite clearly back in 2003 when the idea of Smile Cards came to fruition at our house in Chicago during a Charity Focus gathering. I think it is safe to say that the concept has far exceeded even our wildest goals and expectations. It truly is amazing to see how the smallest seeds can sometimes grow the biggest flowers. Way to make it happen! Awesome and FUN! Amazing - congratulations! We look forward to hearing more story of the ripples. Wonderful! Well done guys! Can't wait to hear what ripples are created! Way to go you guys. It would be fun to see what manifests ... you definitely have our support from India. 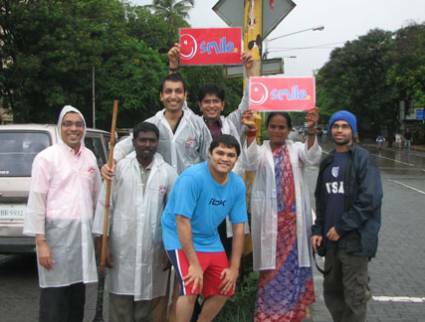 Here's a fun photo from a few years ago, when we distributed umbrellas and raincoats on the streets of Bombay, gave out chai and did all kinds of other small acts ... and then people just spontaneously joined us. WOWWWWWWWWWWWWWWWWW!!!!!!!!!!!!!!!!!!!! So amazing! Totally wasn't expecting this to be the 'surprise'! So so so amazing! I'm so excited about it. It will be totally awesome. Woohoo! AWEsome to see and read the details of the ripples of kindness flowing. :) I'm wondering now if something can be made akin to the tag 10 & give an extra free (like those punchcards that coffee, ice-cream, fro-yo places give out)? Thankyou Nipun for your boundless enthusiasm! Thank you to all of us for our boundless enthusiasm!